42" Automatic Wood & Metal Door Bottom Seal | 42" x 7/8"
Air tight seal... less noise! 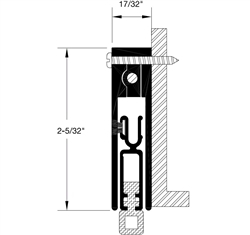 Surface-mounted 42" x 7/8" Adjustable Door Bottom Seal, 330C-42 is an easy-to-install solution that effectively seals gaps between the bottom of your door and the floor. Specify the width of your door and we'll trim the Adjustable Door Bottom. Also available in 32", 36", and 48" length.